The large, nearly square oil painting returned to its home at Florence's Uffizi Gallery for a special exhibit starting Tuesday and running through September. 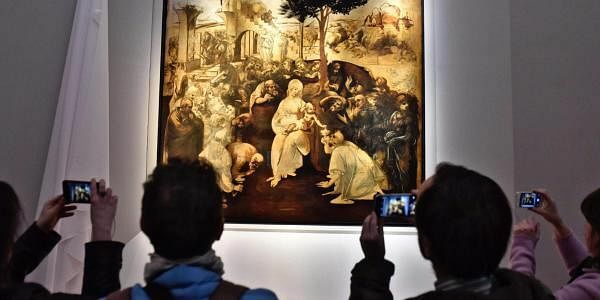 FLORENCE: The unfinished Leonardo da Vinci masterpiece "Adoration of the Magi" has emerged from a six-year restoration cleaner and brighter. Leonardo painted the piece, representing Mary with the infant Jesus surrounded by visitors, between 1481 and 1482 but left it unfinished after leaving Florence for Milan. It had been commissioned by Augustinian monks for the San Donato a Scopeto church but ultimately ended up in the Medici collection. The restoration was carried out by a team at the Opificio delle Pietre Dure, a research and conservation institute of the Italian culture ministry. Experts said the restoration uncovered newfound lucidity and profundity in the work.